Captured in 1388 in the act of stealing back his own cattle, young Sir William Scott faces hanging, then gets one other choice--to marry immediately his captor's eldest daughter, the lady Margaret Murray, known by all as Muckle-Mouth Meggie. With the line between England and Scotland shifting daily, the Earl of Douglas wants to win back every inch of Scotland that the English have claimed; whereas the equally powerful English Percies (under Hotspur) want to win back the land between Northumberland and Edinburgh; and the Murray family is caught in the middle, shifting its alliances to try to survive. 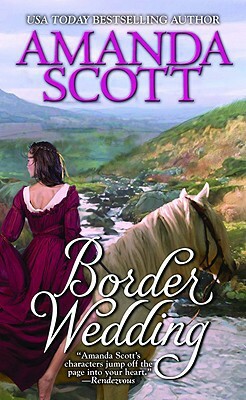 Uncertain whether she is English or Scottish and abruptly married to Sir William who is staunchly loyal to the cause of Scottish independence but who also has promised he'll never take up arms against her family, Meg Murray learns two things: first, Will's word is his bond; second, her favorite brother is spying on Douglas for Hotspur. As Sir Will faces the dilemma of honoring his word to the unscrupulous Murray without betraying Douglas, Meg must choose between betraying the husband with whom she is rapidly falling in love, or betraying her own family and best-loved brother.